Think I may have mentioned that we’d decided to replace our 250’ feet of poor quality anchor chain with 250’ of combo: 90’ of 5/16” G4 ACCO (good quality, made in the USA), chain spliced to 160’ of 5/8”, 8-strand plaited nylon rode (line is “rode” when attached to an anchor). 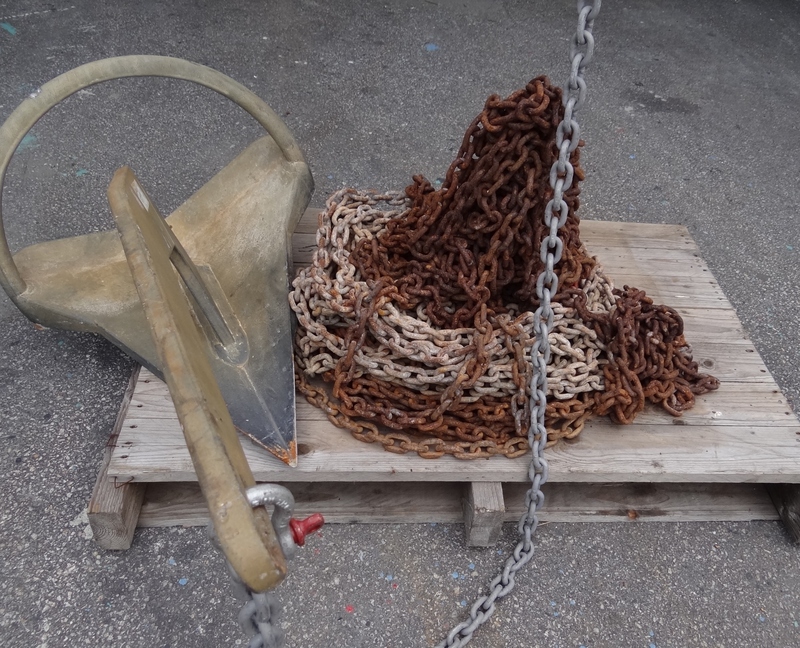 Now what does one do with 250’ (at several hundred pounds) of chain, most of it rusted (did I mention that already?) beyond recognition? And how do you do it? 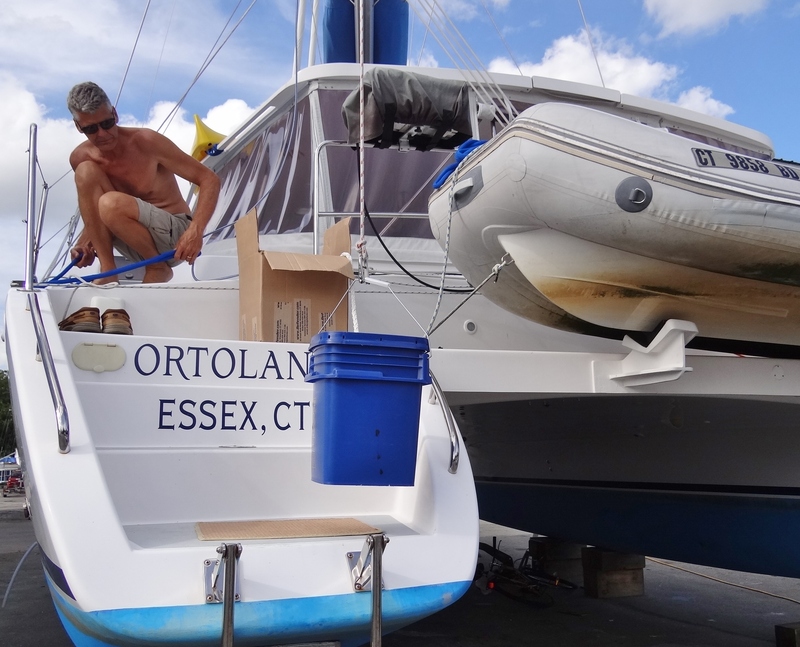 We considered adding it to Davy Jones’ (LIS) Locker, however; we’d need to use it one last time before arriving at Cove Haven Marina in Barrington. Our Deep River Brewer marina said they’d take it off our hands once we got it off the boat, so we figured Cove Haven would do the same. On the appointed day the yard manager plopped a pallet under the anchor chute and told us the pile would be taken away to the big scrap yard in the sky. We’d lower the anchor first and detach it, then run out the chain onto the pallet. The chain would make one final run through the windlass, or would it? As the halfway point approached, the chain’s condition deteriorated with every passing few feet until it was so kinked up that special handling was needed to un-kink it. 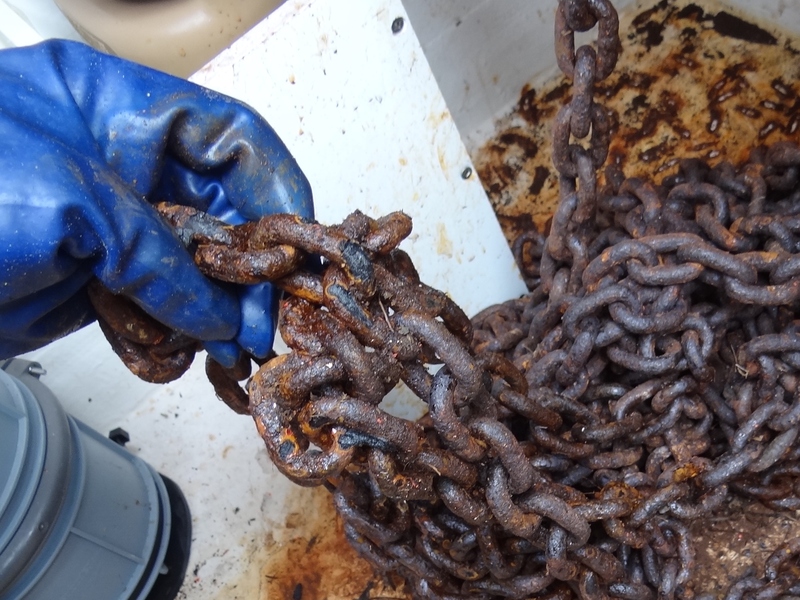 Near the end, it was a fused together mass of rusted chain. 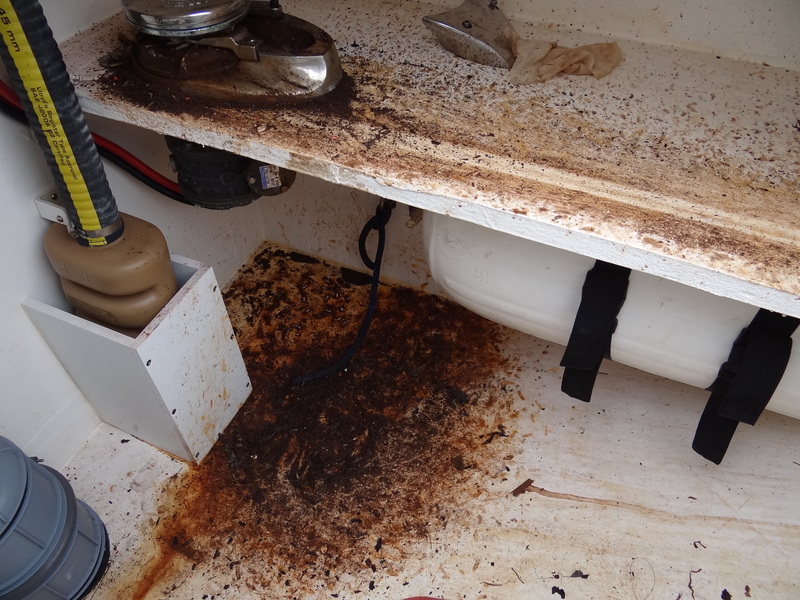 Would you trust your boat to this scrap metal? 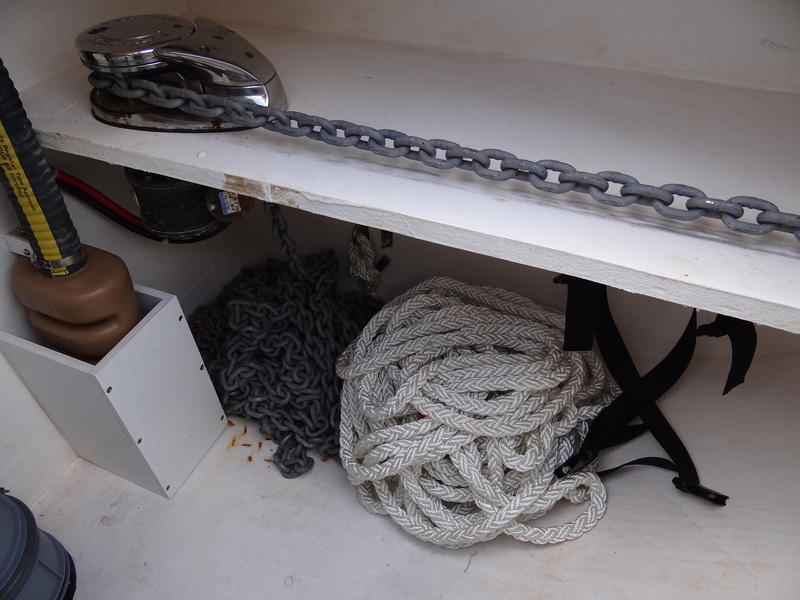 We have higher hopes for the new chain, plus, with less of it, we can easily give it a fresh water rinse-off when it’s not going to be used for a few days or more. 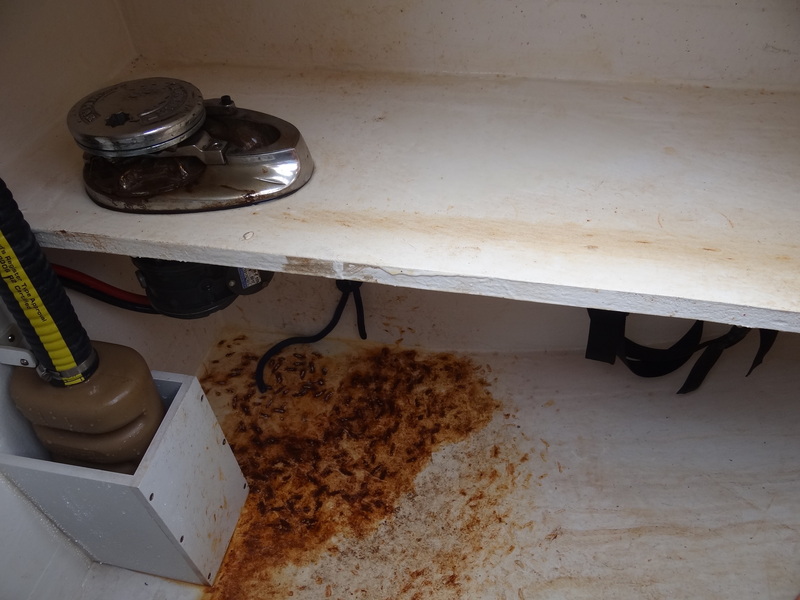 Next step was to clean up the anchor locker which was bearing a strong resemblance to, say, Mr. Jones’ Locker? This was a 3-step process and at the end, the locker looked pretty darn good. The last step was the fun one. The chain was in a pail with the attached rode in a box. The night before we left Deep River we went to the fuel dock so the bike and chain could be loaded on more easily from the dock. Now that I think about it, no wonder that Gunboat beat us, we were unfairly overloaded by at least four hundred pounds, 100 of it chain and rode. We needed to get the chain and rode on to the ground near the anchor chute. Before making that happen we measured and used a red, white and blue sequence to mark 105′, 118′, 130′ etc on the rode using colored tape and substituting yellow for white. 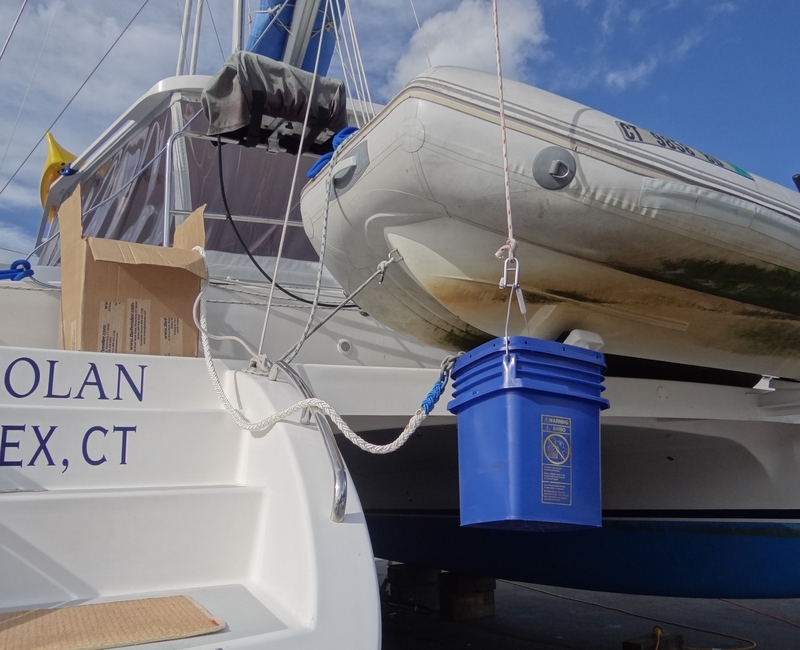 Since the pail was near the stern Russ decided to use the boom and stinger set-up that lifts the dinghy, to lower the pail. Once he made a few adjustments, I grabbed the camera and climbed down. You may notice we have no ladder this year as the marina is enforcing the “bring-your-own” policy, but we didn’t have one to pull out of our hat! I did ground duty while Russ was at the windlass making sure the rode, splice and chain fed through without problem. yep, no problem mon. Before the chain went through we added colored inserts (sorry, forgot to photograph); five reds at 40′, five yellows at 50′, spaced apart reds at 65′ and spaced apart yellows at 80′. 90′ would be known by the splice and 15′ later at 105′ we’d see the first red piece of tape (tucked through the strands). We’ll have to wait and see how well this works out; it should be fine. This entry was posted in Uncategorized and tagged anchor. Bookmark the permalink.